If you've been following my blog for the last few posts, you'll probably have noticed that I seem to be on something of a mystery and period piece kick. Good thing for me that the two seem to gel quite well. As such, it probably won't surprise anyone that this installment is Death at Wentwater Court, the first novel in the Daisy Dalrymple series, a series of cosy mysteries set in the interwar period that I admitted to being so enraptured with a couple reviews ago. Evidently all I need do now is finally get round to watching the version of And Then There Were None that the BBC broadcast last month. 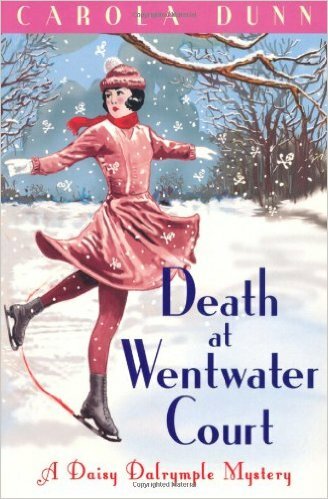 Death at Wentwater Court follows the series heroine Daisy Dalrymple as she visits the eponymous Wentwater Court in order to write a story for Town & Country magazine, about the stately home, its surroundings and history. Whilst there, however, she soon finds that all is not well with the family in residence, largely taking the form of Lord Stephen Astwick who has taken it upon himself to seduce the Earl of Wentwater's new wife. So when he is found dead in a skating pond, with evidence that it wasn't purely accidental, Daisy finds herself assisting Scotland Yard in their investigations. Good Lord, this was the period cosy mystery that I've been looking for. After books tainted by either some unfortunately backwards attitudes, or principle leads who make less-than-convincing turns in the role of detective, this was a nice bit of harmless fluff that was nonetheless engagingly written and absorbing. So, first thing's first. the detective. This role is taken more or less equally by the aforementioned Daisy, and the Scotland Yard inspector brought in specifically for his discretion, a man by the name of Alec Fletcher. The two of them work well together, as they take different approaches to the whole investigation: Daisy has an unusual talent of appearing approachable and kind towards listeners, while Inspector Fletcher has more experience asking the tough questions that Daisy would perhaps consider too delicate to broach. It's a nice balance, and enables the narrative to take a break from Daisy's viewpoint, which quickly becomes anxious and conflicted as it becomes more evident that she will find out that one of the people she has come to care about is a murderer. For a little while, it looked as though there might be a bit of a romance brewing between the two of them, but it was subdued at best. Perhaps something that will develop in later novels, but I'm glad that it didn't overshadow the main mystery. It's easy to sympathise with Daisy's growing anxiety, as the majority of suspects are thoroughly likeable, or at least understandable. With the victim being the kind of cad that makes you wonder how he survived this long as it is, it makes the process of narrowing down who the guilty party is more difficult because most of the characters have motive to have him bumped off, leaving you to figure events out purely by opportunity. Additionally, the period details are prominent enough to give some nice historical flavour without necessarily drowning out the narrative. It's a nice balance.